Abid, M., S. Karimov, K., A. Wajid, H., Farooq, F., Ahmed, H., H. Khan, O. (2015). Design, Development and Testing of a Combined Savonius and Darrieus Vertical Axis Wind Turbine. Iranian Journal of Energy and Environment; previously called: Iranica Journal of Energy & Environment, 6(1), -. M. Abid; K. S. Karimov; H. A. Wajid; F. Farooq; H. Ahmed; O. H. Khan. "Design, Development and Testing of a Combined Savonius and Darrieus Vertical Axis Wind Turbine". Iranian Journal of Energy and Environment; previously called: Iranica Journal of Energy & Environment, 6, 1, 2015, -. Abid, M., S. Karimov, K., A. Wajid, H., Farooq, F., Ahmed, H., H. Khan, O. (2015). 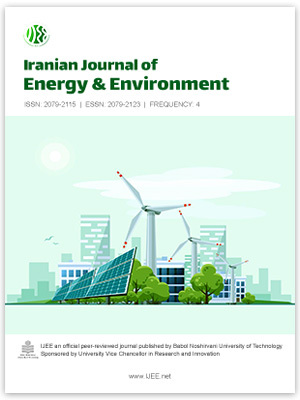 'Design, Development and Testing of a Combined Savonius and Darrieus Vertical Axis Wind Turbine', Iranian Journal of Energy and Environment; previously called: Iranica Journal of Energy & Environment, 6(1), pp. -. Abid, M., S. Karimov, K., A. Wajid, H., Farooq, F., Ahmed, H., H. Khan, O. Design, Development and Testing of a Combined Savonius and Darrieus Vertical Axis Wind Turbine. Iranian Journal of Energy and Environment; previously called: Iranica Journal of Energy & Environment, 2015; 6(1): -.